KSOP focuses mainly on two topics: industry collaborated research topics and education of future greats in the O&P industry. With KSOP Industry Colloquia we created a combination of both. Our goal is to prepare our students the best as possible for their career path in O&P industry. Therefore, from the very beginning, the KSOP concept has been discussed with industrial experts. Up to now half of the KSOP advisory board members are executives of Optics & Photonics companies, i.e, Osram, Carl Zeiss. Based on this excellent point of departure KSOP constantly enlarging its close partnership to greats of the O&P industry. The events for increasing the direct contact between KSOP doctoral researchers and industry we offer annual joint symposia. Doctoral researchers visit a company site and present their research results to the industrial representatives and vice versa. 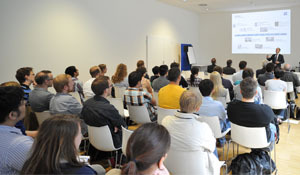 To get an idea of the Industry Colloquia please have a look on the last year Colloquia at Carl Zeiss AG in Oberkochen.